My kindergarten class from Seoul, South Korea! Disclaimer: There are, of course, way too many reasons as to why you should absolutely teach abroad. Why only 8? Why not 10? Or 25? The fact is everyone will have there own opinions. 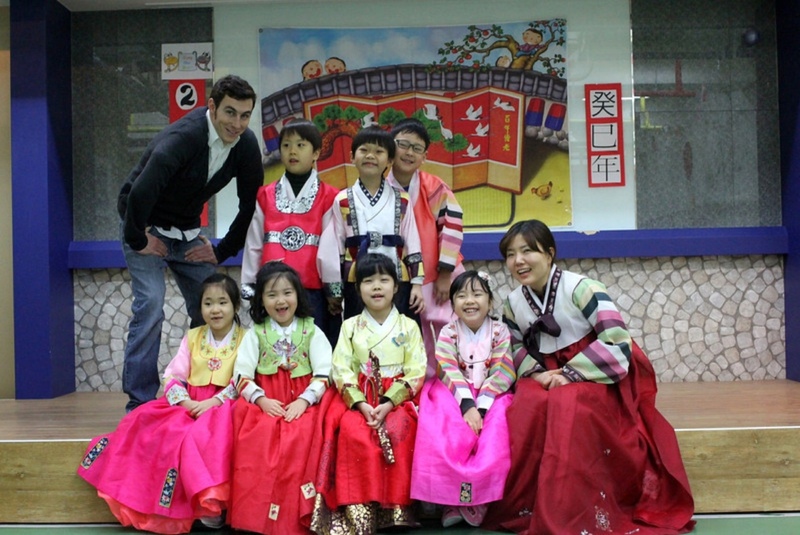 These happen to be the major reasons I loved my first year teaching ESL in South Korea. Not all countries offer the same teaching benefits, however, most will include the experiences I was offered in my year as a ESL educator. What are you waiting for?? GO! Most schools, depending on the country, will offer a great package of benefits to English teachers. On top of a modest salary (and the benefit of an exchange rate) life in another country will allow you to save money and could even offer round-trip airfare, furnished living quarters, paid vacation and potentially tax exemption from your native residence. Use your vacation time and those precious long weekends to explore the surrounding areas. Whether that means flying to another country or taking a bus down to a local vacation spot, each area offers its own attractions. Nowadays, there are budget airlines that make traveling to remote locations much more convenient and less expensive than ever before! For even the most seasoned of travelers, the new surroundings will impact you throughout the entire year. New modes transportation, language, food, and customs are a few new experiences that will heavily impact your life. Hit the pavement, visit local museums, and do as the locals do! I once met a grandfather that fought in the Korean War, while exploring the Contemporary History Museum in Seoul. His English was superb and I learned more about Korean diplomacy in a ten-minute conversation with him than I had in my eight previous months in Korea! Most contracts offer teachers the chance to take language classes outside of school. You can also check out a local tourism group that promotes discounted courses. If all else fails, explore markets, coffee shops, or chat up a local for advice! During your time abroad, volunteer with a local organization, or take up a cause that has a direct impact to society. No matter where you travel there is always a group that is looking for a set of extra hands. Check out Transitions Abroad for some great resources! Often times you underestimate the impact that food has on your ability to cope in a new environment. Street cart vendors selling boiled eggs may not be the most ideal snack, but new and extreme choices are usually the ubiquitous delicacies in a foreign land. Bring along medicine for that nasty stomach bug and dive into a new cuisine! An obvious benefit is through the daily lessons in the classroom. Foreign students are extremely curious about your native country. Incorporate pictures of friends and family, bring gifts from home, and share personal moments from your own life. A year abroad in a foreign country means one thing for most people. Most likely that you have left all family and friends behind in order to discover and explore everything that the world has to offer. Fear not globe-trekker, there are plenty of people to meet and numerous relationships to forge along the way. More often that not the friends you make abroad will impact your life more than you could ever imagine. So, say hello, hola, sawasdee – anything – and get out there. 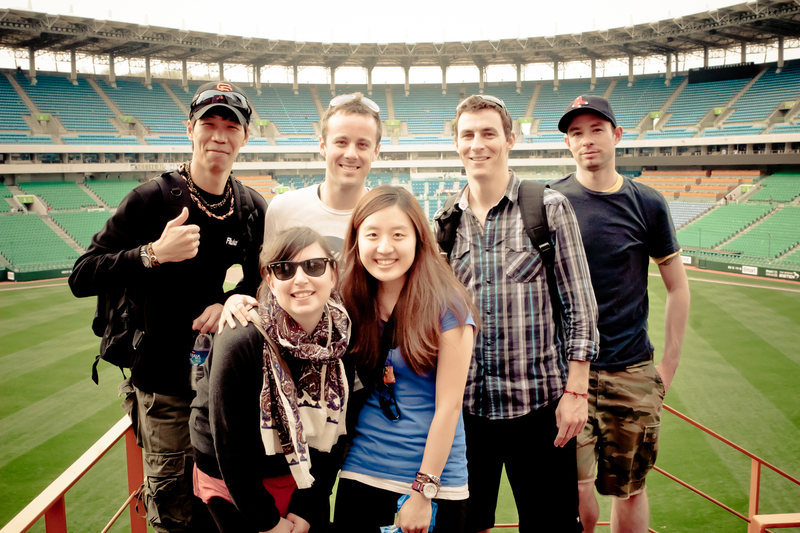 The crew after a Samsung Lions baseball game.